Heat gas or charcoal grill. Cut 18x12-inch sheet of heavy-duty foil; place on large cookie sheet. Spray foil with cooking spray. Unroll dough onto foil. Starting at center, press out dough into 14x10-inch rectangle. Spray dough with cooking spray. In 10-inch nonstick skillet, heat oil over medium-high heat until hot. Add tomatoes, 1/2 teaspoon garlic and the salt. Reduce heat to medium; cook 10 to 15 minutes, stirring frequently, until tomatoes are thickened. Set aside; cool slightly. Turn dough rectangle over directly onto grill rack; peel off foil, and return foil to cookie sheet, sprayed side up. Cook uncovered over medium-low heat 2 to 4 minutes or until bottom is golden brown. (Watch carefully to prevent burning.) With wide metal pancake turner, turn crust over. Cook 1 to 2 minutes longer or until bottom is set but not brown. Carefully remove from grill; place browned side up on foil. Close grill. 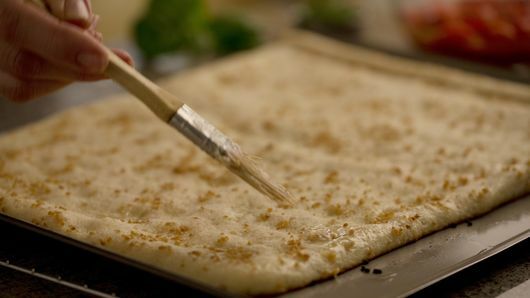 In small bowl, mix butter and 1 tablespoon garlic; spread over dough. Evenly distribute tomato mixture over partially baked crust. Top with cheese. 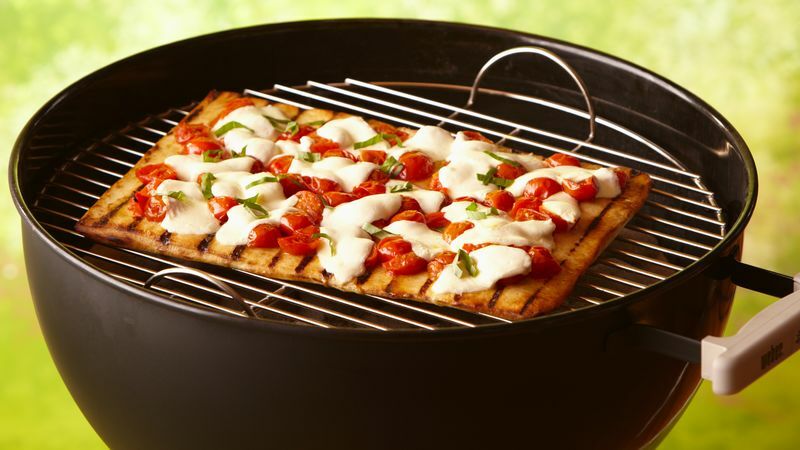 Slide pizza from foil onto grill. Cover grill; cook 3 to 5 minutes longer or until crust is golden brown and cheese is melted. Arrange basil strips over pizza. To serve, cut into 6 rows by 3 rows. To bake pizza: Heat oven to 400°F. Spray 15x10-inch dark or nonstick pan with cooking spray; set aside. In 10-inch nonstick skillet, heat oil over medium-high heat until hot. Add tomatoes, 1/2 teaspoon garlic and the salt. Reduce heat to medium; cook 10 to 15 minutes, stirring frequently, until tomatoes are thickened. Set aside; cool slightly. 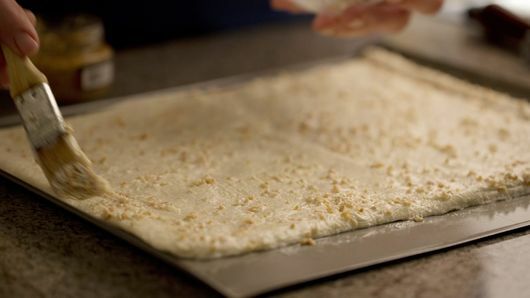 Unroll dough in pan; starting at center, press dough into 15x10-inch rectangle. In small bowl, mix butter and 1 tablespoon garlic; spread over dough. Bake 7 minutes; remove from oven. Evenly spoon tomato mixture over partially baked crust. Top with cheese. Bake 7 to 9 minutes longer or until cheese is melted and crust is golden brown. Sprinkle with basil strips. To serve, cut into 6 rows by 3 rows.